Q. What is or has been the most unusual or interesting job you’ve ever had? A. Regardless of title or position, my job is to become a teacher of all that I have learned in life and on the job. For about 10 years, I sold products and services aimed at advancing genomic sciences and medicine. My knowledge positioned me to lead training sessions at prestigious universities and institutes. When you develop a passion for learning and excel within a subject, the playing field becomes level when liked-minded people come together, regardless of the types or numbers of degrees. Through learning, we advance the mission. Each person is respected for the contribution that he or she can provide to advance learning. Q. 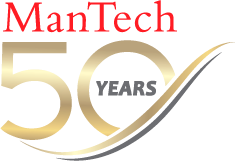 What advice do you have for prospective ManTech candidates? A. Find a career that is meaningful and provides a purpose. I once heard that if you love what you do, then you will never work a day in your life. Find the passion among your teammates and a mission that inspires you. That drive can excite you to rush to get to work versus rushing to leave the office. Q. How do you get your caffeine in the mornings? A. A warm and caressing hug from my significant other, a text from my children acknowledging a new day and the new challenges to achieve and – literally – tea to get the caffeine. On the weekends, I am a car enthusiast and enjoy a good brisk morning drive on a back road. Q. What is the coolest thing about what you’re working on now? A. As a program director, I interface with my teams and assist in delivering excellence for our customers and their missions. My role includes ensuring our employees are empowered within the parameters of the requirements, that they understand the missions and that they feel unencumbered to make suggestions for improvements. We are working to better understand the effects of risk factors, disability evaluations, health care utilization and aggregating data that support multiple programs for analysis of health insurance programs. Our work directly advances the missions of our nation, both of our enlisted and retired military, and our nation’s health care delivery. Q. If you could visit anywhere in the world, where you haven’t yet been, where would it be and why? A. Through my travels with family or my job, I have visited every state in the United States with the exception of Alaska and Hawaii. I have also visited the U.S. Virgin Islands and Puerto Rico. I have worked for companies and traveled to offices in Europe. Although I could be thought of as well-traveled, I have not had the pleasure of sharing travel experiences with my wife. I would like to take an extended road trip across the country while sharing the beauty of our nation with my wife. Q. What is your favorite family tradition? A. My favorite family tradition is to host both sides of our families for Easter and Christmas dinner. We also reflect on the joy brought to us by those no longer living. We watch the younger ones get older and wiser and share life’s lessons to help smooth the path for others. Q. Who is your superhero and why? A. My father. He led me down a path through learning and example, broadening my mind through discovery of people, processes and technologies. As an engineer and a great dad, he instilled the most important lesson in life: empathy for your neighbor and the notion of survival by doing for yourself.